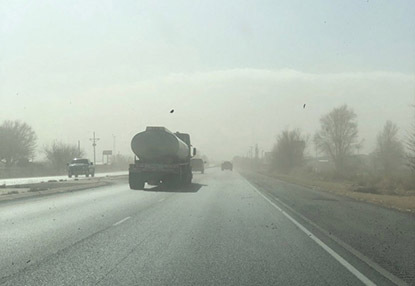 The high winds that blew into the Artesia area Tuesday morning were causing visibility problems on the highways, as pictured above on U.S. 285 South. Motorists were urged to limit travel if possible and exercise caution if driving on highways is necessary. Gusts of up to 50 mph had been recorded as of press time. The winds had subsided by the evening.